purchase something to eat and a lottery ticket (hope I win). On my way back, I notice a horse grazing. I drove by and I said to myself, you are now back in to photography, you should not pass up opportunities like this. I must remember to keep my eyes 'open' to capture great opportunities. So I turned around and drove to the location where I saw the horse. As I was taking the pictures (which came out pretty good) I noticed another horse that was across the road and he/she was looking in my direction. Apparently he/she and the one that I was taking pictures of, are pals. So after I was finished taking pictures of horse no. 1, I drove closer to the other horse and took a variety of pictures of him/her. We all have to be so careful of taking things for granted. This evening, my husband and his friends (one of who is a mechanic) were outside of our house doing some chores. The mechanic was working for my vehicle. It was not working for three days and we have been trying to get the part every where. Eventually we finally got the part and now my jeep i s repaired!!!! Yeh!!! While the mechanic was working on my vehicle, my husband was washing his vehicle. Something seems to be wrong with my camera. since last weekend, I notice that there is a sort of smudge on the bottom right of my pictures. I may really have to get a new camera soon. Now back to my story. The gentleman below recently got this boat and started doing some repairs. These guys love to go fishing so I guess they saw it feasible to invest in a boat. But do you see the size of that boat??? It could get lost in the deep sea!!!! I definitely would not get into a boat that small. I am too much of a coward!! In the BVI, these buses are called Safari. 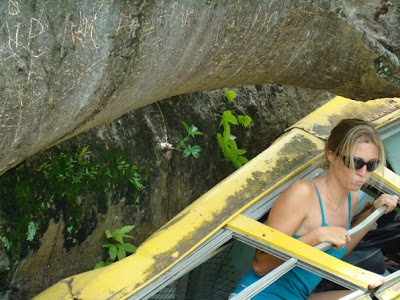 They are mostly used to take tourist on tours around the island. Most bus owners take pride in having their vehicles beautifully painted. In the St. Thomas, USVI, these buses are called 'dollar taxis'. They are a cheap way of getting from one point to another. They are actually quite fun. 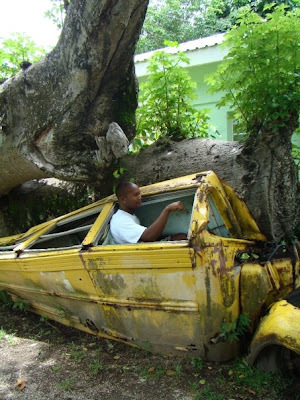 My son is presently in Dominica on vacation and posted these pictures on his Facebook, today. When I saw the first image of the tree that had fallen on the bus, I realized that it was a perfect opportunity to take multitude of pictures. As I perused the rest of the pictures I realized that he did make the most of the opportunity. That day must have been a very devastating period. 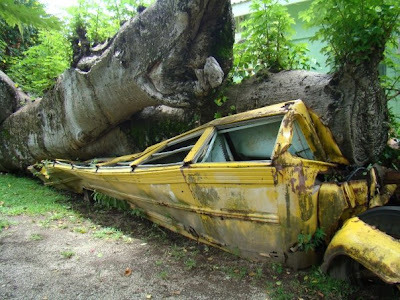 My guess is that it was a hurricane to cause this kind of devastation. Look at the size of that tree! I wonder if there was anyone in the bus? The second picture is of my son in the bus just having fun. The other picture is of his friend, she is also a photography lover. She has been trying for months now to get pictures of him. Everytime you try to take his picture, he turns his back. For what reason, I don't know! He recently purchased a camera for his trip and I notice that he is taking a lot of pictures as if he is interested in photography. Maybe he is thinking of joining me with my photography blog. You are welcome anyday son! Flower Garden made into art work! This is not one of my pictures, it was sent to me by a friend and I found it so interesting as well as funny and it immediately occurred to me to post it on my blog. 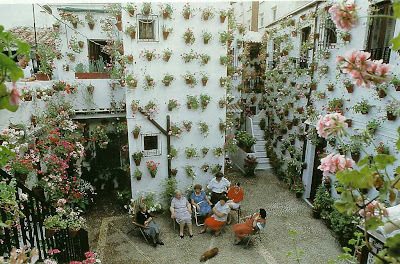 These ladies are very creative, apparently they do not have enough land space to plant their flowers so I guess someone came up with a unique, ingenious idea to hang the flowers on the wall. Marvellous!! I was practising the Depth Of Field feature with my camera today and I think I am getting the hang of it. Like my mother always says - practice makes perfect. It was a bit windy today but with a little patience I was able to get a few photos. I learned something today and it reminds me of my mother favorite sayings (another one). You are never too old to learn and You learn something everyday! I found out that for every blog posting, there is a unique URL!!. I thought that when the older posts are archived, it would be task to retrieve then and refer to it. But not so. It is a no problem task. So with that said, I can refer you to my first successful attempt of Depth of field. Here it is. Interested in building a sucessful website? I just inserted this video on my website and I decided that it is good thing to share with my blog viewers. I remember my first attempts to create my website (I used the free ones). My website looked pretty alright but I was getting NO traffic at all. I read about this traffic thing online, and I found a variety of websites telling me that I would have to promote my website, which of course would have costed me an arm and a leg. Well as you would guess I never got anywhere. Until one day my son told me about SBI (Site Build It)and I never turned back since. Interested in building a successful website? Check out this video. I finally got the opportunity to get some lovely pictures at Surfong Villa Resort. It was a beautiful day today and I decided to walk around the property and just take pictures of any scene that interested me. There are a lot of pictures with large boulders in them. This is basically the topography of the BVI. When you go to Virgin Gorda, there are even larger boulders. There is a spot called 'The Baths' where you will find a lot of them. This resort is a great spot to have a beach wedding. It is just perfect. Alot of people from all over the world have their wedding here. The staff will make all the arrangements from pastor/priest to the reception. And of course, you can stay at the resort for the honeymoon. Entertainment such as sailing for the day or island tours can be arranged for you as well as meal arrangements. Meals are also served inhouse upon request. If you are just staying at the resort to experience 'Natures Little Secrets', arrangements can be made to transport you to and from the airport and any destination you desire. There has been some recent additions to the resort - two individual villas called Pool House and Beach House. The names speak for themselves. To get more information about this resort, just clicking on any of the pictures and you will be directed to their website. I have been doing some research on this feature with my camera where you can focus on a particular object and everything around it is blurred. It all started with this particular plant to the left. It is part of a flower arrangement at my office and it is called 'Cat Tail'. But there is so much 'noise' in the area that the object would get lost in the picture. Then I thought that if I could have the flower center of focus and everything blurred, I would have accomplished my task. Last week Saturday I was telling a friend of mine about my problem. As a matter of fact she is the one who introduced me to this feature of the camera. She gave a crash course that day and apparently my camera does not have the capability to do this feature. This feature is called dept of field. I left her home a little disappointed. Today as I returned to work from making my banking rounds, I saw some colorful bugs on a flower plant. I decided to take some close up pictures of these bugs. As I was zooming in and taking the pictures (I held the camera as close to the bugs as I could) I realized that the pictures were looking like they would result with the depth of field feature. I was excited. Now that I have downloaded the pictures I realized that I have done it. During the rest of the day I was taking pictures ever chance I get. The one with the plant looks relatively good. I would have to let my friend review them. Looks like the bug was posing for me!!! I finally found a slide show feature that I could add to my blog and website. I just created them today and am very impressed. The features are so cool. I took these pictures when we took my husband's family to a sailing trip in 2007, to an island Jos Van Dyke. It is one of the popular islands in the BVI territory. I was just taking pictures while everyone was having fun. I just discovered this other one and it was so easy. I prefer this one for my cooking website. My story today is about my fear for the BVI hills. When I first arrived here in 2000, I was very scared to drive on these hills. Some of the roads are constructed very steep instead of a gradual incline. I could not understand why I was so scared of these hills, until one day I went driving and told myself I had to overcome this fear. these pictures but I can assure you that they are. I think what added to my fear was in some areas, instead of pitch being used, the roads are covered with concrete. In my imagination, when these roads are wet, you could easily slide off the road. Some contractors. take the extra precaution to carve the roads to eliminate the smoothness. To my surprise, I am not the only that is scared to walk/drive on these steep hills. When my mother visited the BVI and we took her on a tour, she was also scared of the hills. When we first drove her down this hill (on the left), she started to scream. We have a good laugh at her. One day I went for a drive and I used my son's car, there is another hill, which I had planned to take a picture of today but did not feel like driving to Sea Cow's Bay today. I decided to drive up that hill with my son's car. The poor car could hardly make up the hill. I thought that i would have to reverse down the hill but with a little patience, I made it to the top. Update 16th Jul 2009: I drove to Sea Cows bay yesterday with my son's car and I was able to take a picture (the last one) of the hill I wrote about earlier. I know the car was not able to make it up the hill so I took the picture from the bottom of the hill. I am really proud of these pictures . I took them this evening while my husband was roasting two breadfruits, in our backyard. I was taking step by step pictures specifally for my website. I even did the page a little differently and let the pictures tell the story. Basically I consider this page a feature page. I am always arguing with him because he says that roasting is not cooking and my debate is that roasting is a method of cooking. I also took some videos of the process only to find out, when I was downloading the pictures, that I did not record the videos. Therefore I lost all of them. I had to a sk my son for assistance and he told me that I had to press the same button, that I use to take out the pictures, to record the videos. Ah well!!! I am a little disappointed but I know exactly what to do next. I never really used the video feature part of my camera before. I got some good in motion pictures here. A few days ago my husband and I went to a beach party. On this particular landing, we sat close by and had our lunch. Some left their drink and soon after, this bird dropped by and had a few drinks. I zoomed in with my camera but this the closest I could have gotten. If I had physically moved closer, the bird would have flown away. It was really amazing, the bird had a few gulps of the fruit juice, turned his back and then flew away. Then I said to my husband, it is a good thing that it was not an alcoholic beverage otherwise the bird would be flying to the trees and things. LOL!! I tried 'blowing' up the image but I most of the resolution was lost. Hopefully in the near future, I will be able to afford a more high tech digital camera that would be able to handle this task with ease. I am not into taking pictures of buildings but the reason I took this picture is because it has a story behind it. The owner is a fello trini and he is a contractor. The pink castle like house (above) is his (he built it). Now tell me why did he choose those colours. I just don't understand it. I would NEVER choose those wild colours to paint my house in. Well a few days ago I met him in the grocery and he told me that he built another house. So I went looking for it, following his directions. I got a little lost that morning but when I did follow his directions to the "T", I saw it. And you know how I knew it was his? Just look at the picture (below) and I think you would see what I am talking about. I just received another compliment about my blog today from some friends of mine and two of them said that they admired my gift because they are not technically inclined. To be frank, this all come so easy for me and it is something that I like doing. I guess I have taken my gift for granted. I then realized that this is one of my gifts that I am yet to give thanks for, and have seriously taken for granted. So this my opportunity to say Thank You for this gift, Thanks You for constant inspiration!!! THANK YOU!!!! For this black beauty, there is a story to be told. One beautiful Saturday morning, I went to the coffee shop at Trellis Bay, Beef Island, BVI, to have some breakf ast. As I was enjoying my meal and the environment, I saw this black thing in the sea moving toward shore. I could not identify what it was, it looked really odd. It was moving!!! I watched closely. Then it reached shore and to my surprise it was this dog!!! He swam from where ever to shore! I asked the lady at the cafe about dog and she said tha t he does it regular. He lives on the island just a short distance from Trellis Bay. Apparently when he is bored, he just takes a nice swim over to the coffee shop. He has to be a very strong swimmer. In this picture to the left, behind the yachts, you will notice some trees. That is a little island that host a restaurant called Last Resort. This is where the dogs lives and where he swam from! Absolutely Amazing!!! This is an interesting story. One day my husband and I went to pick some fruits from a friend's tree in his back yard. My husband went down the hill while I stayed in the safe zone. On his way back up the hill he was eating a fruit that I know to be very acid and it is unheard of to eat it in the manner he was eating it. He was taking large bites. You should have seen the expression on my face. In addition to that, he was offering me the fruit to take a bite. I absol utely refused. After numerous offers I gave in because he kept telling me that it was sweet. Boy with that first mini bite, I was in heaven. The fruit was really sweet and the juices were dripping from my mouth. I was totally surprised. I am always telling people about this story. Today we went to pick more of this fruit because the tree has a lot on it. Of course I walked with my camera, so while my husband was picking, I was 'snapping' away. In the picture above, he had just taken a bite. I wanted to actually get him taking the bite. Ah well next time I would not be so slow. The name of this fruit is Five Finger. Update: My friend just told me that this fruit is also known as Star Fruit. When you slice them from the top, they look like stars. Daily Puppies are so cute!